After a nine-month full refurbishment, the Highspeed 7 has returned to the port of Piraeus to begin operating the Heraklion – Santorini – Ios – Paros – Mykonos route for the summer season, it was announced on Monday byHellenic Seaways. The Highspeed 7 is said to be the fastest passenger ferry in Europe with speeds up to 42 knots. According to the announcement, the upgrade of the Highspeed 7 took place at Italian shipyard FINCANTIERI S.p.A. in Trieste, following the launch of an international tender. Renovation works include the complete reconstruction of the bridge, the upgrade of safety and navigation systems and the complete replacement of hotel equipment. Another level of air type seats were added, as well as two luxury bars. The ferry’s outside space has also improved to protect passengers from wind. 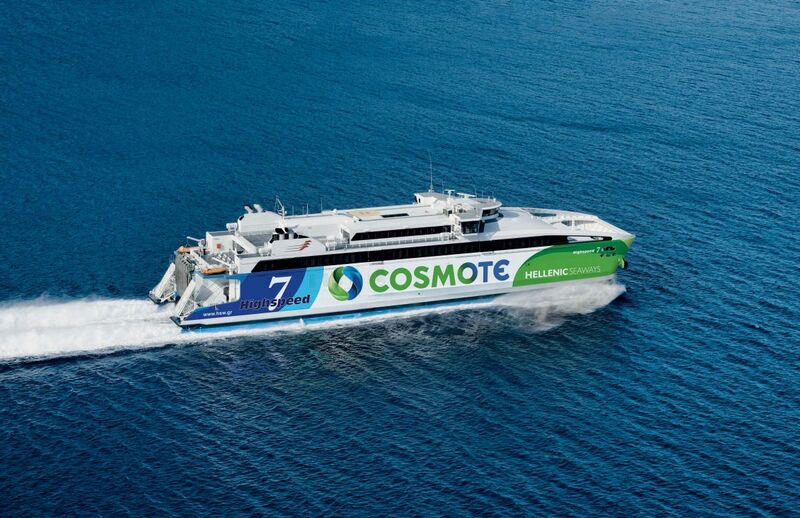 The Highspeed 7 will launch for the season on Tuesday, June 14, at 13:50 from Mykonos to Paros – Ios – Santorini – Heraklion. Services will run until October 17. The high-speed passenger – ferry catamaran was constructed in 2005 and upgraded in 2016. It has a length of 85 meters, a width of 21.2 meters and can carry up to 1,160 passengers and 105 vehicles and has a crew of 26 people. Shipbuilding countries are Australia and Italy.